Real Techniques Nic's Picks Brush Set. 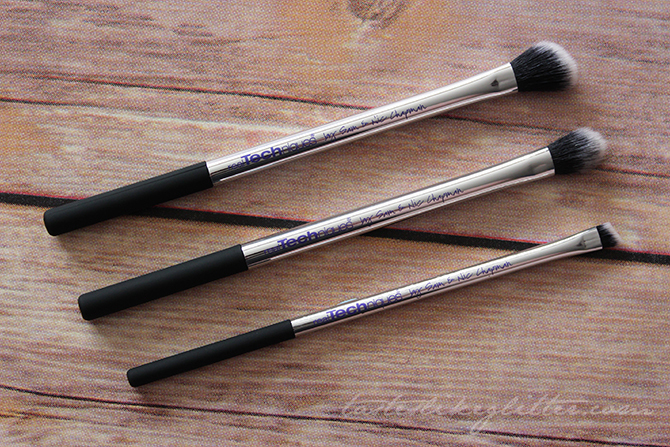 I love Real Techniques brushes, they're super affordable and really great quality. When you opt for cheaper brushes sometimes the quality isn't quite there but that's not the case with these at all. As soon as I saw these I knew I had to get them, the shiny mirrored handles were calling out to me. As it goes, I purchased it for myself but I was also gifted a set for Christmas so I have two, even better! 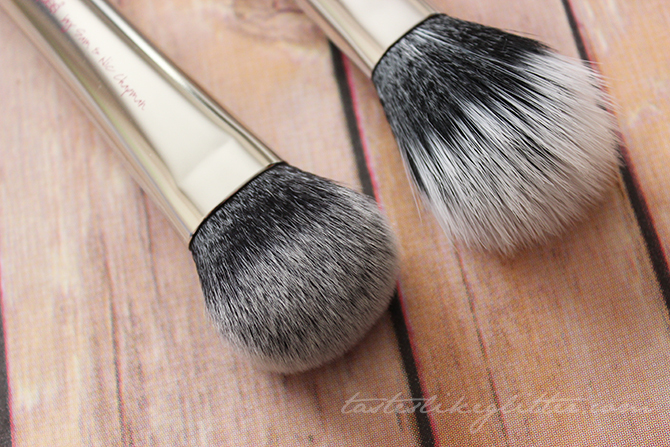 Duo-Fiber Face Brush - These kinds of brushes are great for lightweight application with blush and powder. They pick up just the right amount of product without overloading your brush, so it's perfect for those that are heavy handed with their blush. Cheek Brush - This is quite similar to the Expert Face Brush but I've yet to try it with foundation. This is great for me as I don't like adding too much blush. It's got a small enough brush head to apply blush just where you want it. Angled Shadow Brush - A lot of people tend to dislike this shape of brush. I really like it for blending out crease colour once it's been applied. Especially if you're going for a really light look, it blends it out effortlessly. Base Shadow Brush - I've got a few of these brushes from Real Techniques and whilst I don't find they're very good at packing colour on the lid. They remind me of a less densely packed version of M.A.C's 217, which works great for blending out harsh lines. It's even useful at spot concealing. Eyeliner Brush - Lastly we have the angled liner brush. I find this works great on the brows, both in applying colour and cleaning up afterwards with concealer. It also works really well with applying colour along the lower lash line. You can also use it to make sure your lipstick is really sharp. I really like this set of brushes, it has a bit of everything it. You have something your base and something for the eyes, with one that can also be used on the lips. What I love about Real Techniques brushes (bar the price point) is that not only do they perform really well, they wash just as good. They keep their shape once dried, retain their softness and they don't ever shed bristles. Real Techniques are great if you're starting out with buying brushes or just adding to an already growing collection. I really recommend this set, it stands out amongst other plain brushes and it's really good at doing what it's supposed to. Original Source Skin Quench - Lime & Coconut Oil. 365 Blog Topic Ideas - Dana Fox. Lush Lip Scrub - Popcorn.